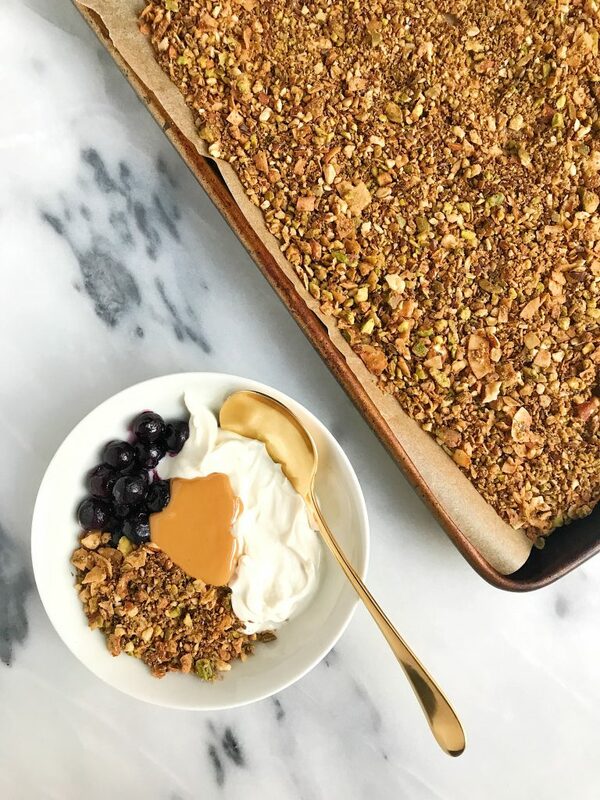 Pistachio Cacao Grain-free Granola that is vegan and sugar-free and my thoughts on Be Well cleanse! Hi friends! Checking in here to share that I am officially DONEZO with my Be Well cleanse. 14 days and many smoothies later, I have completed the elimination diet. In case you missed my Almond Coconut Fudge Bars post, I suggest reading that first to get an idea on what I am talking about. It was the first of my favorite recipes I made for this cleanse. Since you cannot have gluten, grains, dairy, soy or pretty much any sugar, it certainly put me to the test. .. And likely some other things I am missing but you get the point. You have 3 shakes and 2 full meals a day for 14 days. I am someone who craves sweet over savory. I’d rather eat a bag of chocolate cookies than pretzels. Most of the time I crave banana almond butter toast as opposed to an egg sandwich. So needless to say, these past 14 days were a bit of a shock for me. But to be honest, it wasn’t as hard as I thought. I am the type of personality who adjusts pretty easily to things after awhile. I do not favorite change or being taken out of my routines but once I am moving and grooving again, it’s totally fine. It took a couple days but I was in a “Be Well” routine before I knew it. It seems very intimating and overwhelming to do something like this and I would be lying if I said I wasn’t nervous. I try to not be regimented with food so this was going against what I really preach to myself but I truly trust Dr. Lipman, and it is only 14 days! While I do eat dessert daily and love a good banana bread, I really don’t eat excess sugar in that many things. Sure it is in most granolas, bars, etc. but it’s pretty easy to make those things at home (insert this granola and my fudge bars). I wasn’t able to eat my usual granolas that I love, but I am so happy to be adding them back into my life again. I loved that this elimination diet really wants you to EAT. I’m not a fan of juice cleanses or the whole “let’s not eat until dinner” thing so the fact that Be Well wants you to eat and feel nourished is what really made me feel good about doing this. I would bulk up my smoothies each morning and top it with this grain and sugar-free recipe. I wanted to fill up with a lot of healthy fats and protein to keep me fuel and prevent me from losing weight. My meals were solid sized and I did have the shakes and a green apple or nuts in between meals. I noticed I felt hungrier during the day at first but just ate whenever I wanted and added more fats in each meal. The powder or “shake packet” tastes pretty berry-ish to me. I enjoyed adding it to my smoothies, especially with blueberries! It was really delicious. If the shake packet didn’t really go with what I was making I just had it in a drink with water or almond milk. Sometimes the most random food items or even drinks can be triggering symptoms for you. For me it isn’t specific food groups that bother me like gluten or dairy. It is more particular items that can make me break out in hives, cause bloating, etc. I’m not sharing yet as I’m still testing/reintroducing but this really taught me and further proved to me how our bodies truly are so different from one another. Never comparing my body to someone else’s. Going out for meals isn’t ideal on this but I did do it a few times. I am fortunate to live in an area such as NYC that has endless healthy and “clean” options so it was pretty easy for me. What wasn’t easy was teaching a baking class to make these cupcakes and not eat any. I just kept reminding myself it was on 14 days! Not the end of the world. The Be Well cleanse in my opinion, is a great option for someone to try if they are dealing with random symptoms that may be linked to or triggered by food. It’s also a great way to reset your body and figure out what foods actually make you feel good. I wouldn’t want to do this cleanse longer than 14 days (at least not around the holidays!) and felt that two weeks was enough for me personally. I haven’t had any hives or weird bloating in two weeks, so I am very happy I did this! I can definitely see myself doing this again next year or in six months for a reset. 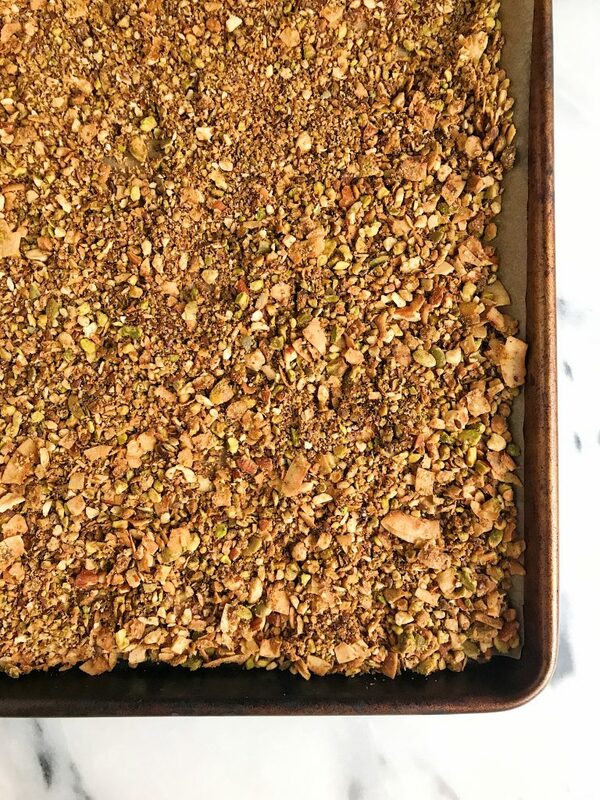 Now let’s get to this grain-free and sugar-free granola. It was my go-to crunchy snack and breakfast topping on Be Well and is now going to be a staple in our weekly line up. Add in coconut oil and almond butter and mix again (note you can add honey or maple syrup here if you want some sweetness) if the almond butter isn't liquid enough please melt! This post was not sponsored by Be Well but I was given the cleanse complimentary to share with my amazing readers! Wow this looks delicious! What would be a typical serving size? i usually eat 1/3-1/2 cup of it with my smoothies! So great! Love that it’s quite customizable. 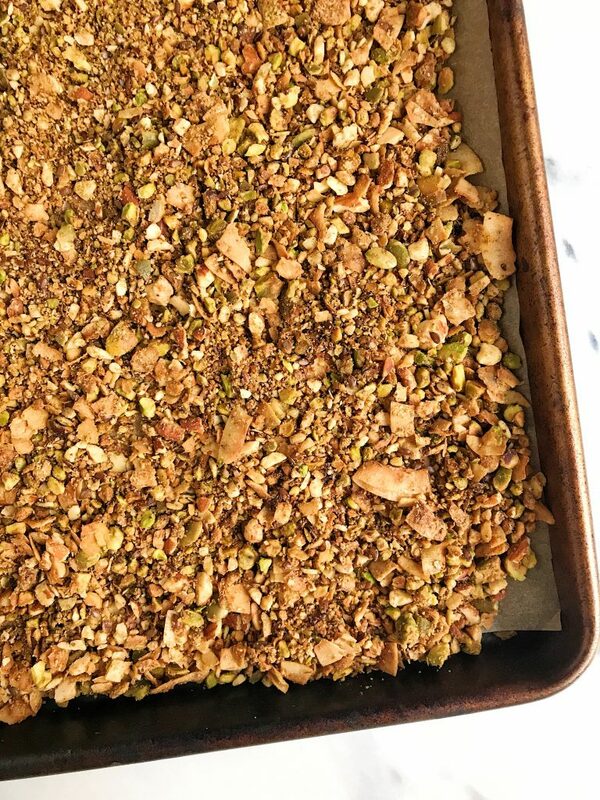 I’ve been doing keto (ahhh), so this is a lifesaver… Really missing my granola! I used walnuts, hemp seeds, and almonds, then put some sliced/slivered almonds directly in there for more of a bite. Also used flaxseed meal since I didn’t have whole seeds but wanted that nutty flavor… Used a bit of sunbutter with the almond butter for a saltier component, as well. Are you going to share details about your reintroduction process? I’m just finishing up an elimination diet and worried I may bungle that part! This was/is delicious. Thank you.